Future and Cosmos: Scientific American's Very Lame "Ghost Explanations"
Scientific American's Very Lame "Ghost Explanations"
1. "Low frequency sound." Low-frequency sound or infrasound can be produced by things such as earthquakes, avalanches, volcanoes, diesel engines and wind turbines. Since there is no evidence that such a thing can produce anything more than a chill or a feeling of uneasiness, and since 99% of apparition sightings do not occur where there are significant amounts of low frequency sound, this explanation is basically worthless in explaining apparition sightings. 2."Mold." The evidence that mold can produce hallucinations is not strong. This report (around pages 60 to 85) by the World Health Organization makes a comprehensive and authoritative analysis of the effects of mold. While the study notes lots of respiratory effects, it does nothing to substantiate any psychiatric problems caused by mold. The study's one comment on the topic is this statement: “The Institute of Medicine (2004) included only a few case reports, with inconsistent findings for neuropsychiatric effects." While a mold explanation might be conceivable to explain an apparition sighting in a very moldy environment like one of those abandoned mental hospitals where TV ghost investigators sometimes camp out, such an explanation is worthless for explaining 99% of apparition sightings, which do not occur in moldy places. 3. "Carbon monoxide." The claim that carbon monoxide can cause apparition sightings rests upon a single 1921 case. People discussing that case say something like, "An apparition was seen, and then their furnace was fixed -- their furnace must have caused the ghost sighting." But it is not scientific to suggest a causal relation based on a single association in time, just as it is not scientific to say, "Someone once saw a ghost on the night he ate zucchini, so zucchini eating explains ghost sightings." About 20,000 to 30,000 people are sickened by carbon monoxide each year in the US, and not even 1 in 100,000 has a ghost sighting when such a thing happens. In the 1921 case, headaches were reported (a typical symptom of carbon monoxide poisoning), and 99% of those who report apparitions do not report headaches at the time they see apparitions. So we can conclude that carbon monoxide is not a significant cause of apparition sightings. 4. "The power of suggestion." This can explain only very little, perhaps the kind of thing where you go to a supposedly haunted house, your friend says he feels a spooky chill, and you say, "Yeah, me too," through the power of suggestion. 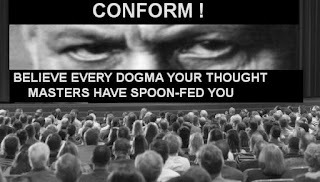 But the power of suggestion cannot explain an apparition sighting -- people don't hallucinate apparitions merely because of suggestions. And the vast majority of apparition sightings occur suddenly, in ordinary places, where no power of suggestion is going on. 5. "Drafts." This can explain only very little, like maybe a case of someone having a spooky chill if he camps out in an abandoned hospital. Drafts can't explain cases when people report seeing or hearing an apparition. 6. "We enjoy being afraid." This might explain a tiny bit of what's going on in "ghost tours," but is worthless for explain the vast majority of apparition sightings, which occur suddenly and unexpectedly. The article's writer (Sabrina Stierwalt, an astrophysicist) shows no signs of having spent any time studying the literature regarding apparition sightings. The six items on the list are totally inadequate to explain two common types of apparition sightings. 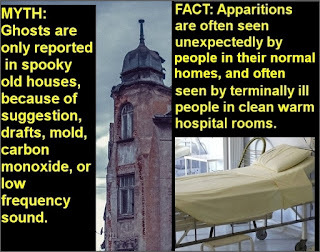 One very common type is when a terminally ill person (typically in a nice clean hospital) will report seeing an apparition of a dead person (typically a family member). In their book At the Hour of Death: A New Look at Evidence for Life After Death, based on a wide survey of hospital personnel, the researchers Karl Osis and Erlendur Haraldsson showed that it is extremely common for dying patients in their last days to report seeing apparitions of deceased people. Below are two accounts from page 3-4 of the book, which can be read by clicking on the link above and then clicking on the "Look Inside" link. The authors tells us that these accounts are "quite typical of more than a thousand cases of this sort that we have collected." Case 1: "A seventy-year old patient had seen her deceased husband several times...She predicted her death, laid out her burial clothes, laid down in bed for a nap, and died about one hour later." Case 2: A sixty-year-old woman "tortured by intestinal cancer" smiled and called "her [deceased] husband by name, and said she was coming to him....It was as if something beautiful had opened up to her." Another common type of apparition sighting (not at all explicable by the six items on the Scientific American list) is what can be called sudden veridical apparitions. In such cases a person will unexpectedly experience an apparition of a person who was thought to be alive, only to later find out that such a person died, typically on the same day (and often the same day and hour) as the person who died. In two previous posts, here and here, I have summarized a total of 50 such cases. In this post I will summarize 25+ more cases of this type, cases not mentioned in those posts. Below are some cases from Volume 2 of “Phantasms of the Living,” a classic two-volume work by Edmund Gurney, Frederic Myers and Frank Podmore. By following the links, you can go to the exact page of each case I have given. The very diligent writers of the book (and their helpers) checked out almost all of these cases, getting corroborating evidence. So, for example, if a husband reported seeing a particular thing, a wife might be asked to produce an account of what the husband said at the time. And if someone reported a death occurring at a particular day, public records were checked to see whether such a person's death occurred on that day. Page 174, Case #310: A reverend Fagan, his cousin Christopher, and a Major Collis all heard the name “Fagan” called from a source they could not determine. Two of them said the voice was like the voice of Captain Clayton. The next morning a telegram arrived saying that Captain Clayton had died on the same day and hour as the voice was heard, from an accident while playing polo. Page 178, Case #312: Georgiana Polson reported seeing a woman who she thought was “something unnatural” and exclaimed, “Oh, Caroline.” The woman was dressed in black silk “with a muslin 'cloud' over her head and shoulders,” and was seen to glide fast and noiselessly. At the same time, a “little nursery girl” was terrified of going into a room where she saw a similar strange figure, “in black, with white all over her head and shoulders.” Gorgiana later found that Caroline had died on the same day the apparition was seen. Page 179-180, Case #313: A son was awoken in the middle of the night by a feeling of terror. His mother said that on that night she had seen an "apparition" of Susan appear in her bedroom. After feeling a cold chill, the mother fainted. It was soon found that Susan had died unexpectedly (apparently on the same night). Page 182, Case #315: A Mr. de Guerin reported that in 1854, he saw something that “appeared like a thin white fog, a misty vapour....after a few moments I plainly distinguished a figure which I recognized as that of my sister Fanny.” He said “the vision seemed to disappear gradually in the same manner as it came.” He later learned that “on the same day my sister died – almost suddenly.” Mr. de Guerin immediately mailed a description of what he had seen to another sister, Mrs. Elmslie, who lived far away; “but before it reached her, I had received a letter from her, giving me an almost similar description of what she had seen the same night, adding 'I am sure dear Fanny is gone.' ” She reported that the apparition disappeared. Page 227, Case #340: While in England, the mother of W.L heard a mysterious voice which the mother identified as the voice of her son, who was in America. The voice, also heard by her husband, said, “As I cannot come to England, mother, I have come now to see you.” It was later found that the son had died on the same day. Page 241-242, Case #349: In 1845 while at college Philip Weld died in a boating accident. The president of the college immediately set out to travel to the father of Philip to deliver the bad news. Arriving the next day, he was surprised to hear the father say that yesterday he and his daughter had recently seen Philip walking between two persons, one wearing a black robe. “Suddenly they all seemed to me to have vanished,” said the father. Later, the father saw a portrait that he identified as one of the men who he had seen with the apparition of his son. The portrait was of a saint who had died long ago. Page 259, Case #357: Seeing something strange while in America, John Sherbrooke exclaimed, “God bless my soul, who's that?” Colonel Wynyard said, “That's my brother, John Wynyard, and I am quite certain he is dead.” Later “a letter from Mr. Rush, the surgeon, announced the death of John Wynyard at the moment, as near as could be ascertained, when the figure appeared.” Two and a half years later John Sherbrooke saw someone who he thought resembled the figure he had seen when the “apparition sighting” occurred. The man turned out to be a man who looked so much like John Wynyard that he had often been mistaken for him. Page 449-450, Case #485: While in Russia, a man saw an apparition of his fiance who was in England. He saw a kind of bluish vapor that turned into the form of his fiance. The apparition "seemed to melt away into the vapour, which also disappeared." The man then found that his fiance "died of inflammation of the brain, on the same day, and about the same time, as I mentioned having seen the apparition." Page 451-452, Case #487: When she was a young girl, a woman saw her brother by her bedside, looking wet. When she called his name, the figure vanished. She later learned that her brother had died in India, of drowning in wet quicksand. Page 452-453, Case #488: While in Gloucester, England a William Garlick saw an apparition of his brother, who was far away heading for the East Indies. The apparition seemed to slowly fade away. William later found that his brother had died, and said "the date and hour of his death, as nearly as could be calculated, coincided exactly with that of his appearance to me." Page 453-454, Case #489: A Mrs. Nind said that she saw next to her bedside the figure of her father-in-law, who spoke a few words and then disappeared. She soon found that her father-in-law had suddenly died about eight hours earlier. Page 455, Case #491: On the morning of her father's death, a Mrs. Clarke said that she saw at her bedside an apparition of her father, which appeared for five minutes. Her father died in another location. Page 456, Case #492: A Mrs. George Gordon saw an apparition of her father, who was far away in India. Months later she received word from India that her father had died on the same day. Page 458, Case #494: H. Atkins reported that while at sea he saw a crew member who said that he saw his mother on the deck. H. Atkins told the man that this was quite impossible. The crew member later learned that his mother had died "that very night." Page 459, Case #495: In America, George Waddington awoke to find the figure of his great aunt in front of him. "She died early that morning," said George, and the death occurred in England. Page 460-461, Case #498: Mrs. Chermside said two lovers were parted when the man announced he had to take troops to Canada. One night the woman (E.B.) saw the man in her bedroom, apparently dressed in "grave clothes." She asked why he was dressed that way, and he said, "Do not laugh; this is my new uniform." According to Mrs. Chermside, "A month later she received word that he had died on that very night, and that the last word he uttered was her name." Page 462, Case #500: On December 18, 1872 a woman saw her husband appear, and "he as suddenly disappeared." She later received a "letter by the Australian mail" that her husband had died on that very day. Page 473-474, Case #509: A Mrs. Sprauge awoke at about 3 o'clock on June 14, 1868 to find her mother at the foot of her bed. Rising up from the bed, Mrs. Sprauge then found her mother was gone. She later received a telegram saying that her mother had died far away. Upon questioning the nurse, Mrs. Sprauge found that her mother had given her "last sign of life" at the same hour and day as the apparition, dying three days later. Page 474-475, Case #510: A Samuel Mendicott saw an Archbishop appear at the foot of his bed. He later found that the Archbishop had died at the same hour and day. Page 475-476, Case #512: A man saw at his bedside a Mr. Mercier, who "showed me the left side of his head, all bloody, and covered with his brains." The figure "ascended, as it were, through the ceiling." A day or two later the newspaper reported that Mercier had died. Further inquiry showed that he was struck on the left side of the head by a church bell. Page 486, Case #523: A Mrs. B reported that her father had come down one morning, saying that a certain male, known to be sick, had appeared at his bedside. Later she found out "he had died at the same hour that my father had said he had a visit from him." Page 694, Case #696: On a Sunday R. Markam Hill reported that a man rushed into the room he was in. Hill reported that the "apparition" disappeared, and that he thought the man was his uncle. The next day a telegram came announcing the death of his uncle on that Sunday. Page 695-696, Case #697: A man's wife woke her husband to report an intruder in her bedroom at about 1 AM, but the man could not be found. The next work day the man found out that a Mr. Z. had died at about 1 AM, the same time the wife's report was made. When the man said he had some sad news to report to his wife, the wife said she knew it was that Mr. Z had died, for that was the one who she saw in the bedroom. Page 703, Case #702: A Mr. Griffin reported that he woke up and saw an old lady friend of his, who spoke to him. He later "heard of the old lady's death, at the same date and hour," receiving notification by mail. So in this post and the two other posts of the same type (here and here), I have summarized a total of 75+ different cases of people who experienced an apparition of someone, and then soon found out that such a person died at about the same time, almost always on the same day, and often on the same day and hour. Not one of these cases can be explained by the six explanations that appeared in the Scientific American article, none of which offer any explanation for such synchronicity. That article is Exhibit A showing that scientists have no substantive explanations for apparition sightings reported by ordinary people. Such cases sometimes occur in recent years. For example, on pages 4-6 of the 2018 book Already Here by Leo Galland M.D., Leo tells us that while waiting to hear the fate of his son "three hours away" after an accident, he and his wife saw an apparition of that son. In the same hour of that day, after seeing the apparition, Leo learned that attempts to revive his son had failed.